There are many layers in our life. We need to look forward towards the different arenas and need to learn all that life has to offer. Kaleidoscope: Colours of life is written to make one understand the different situations and probable way to make one’s path less cumbersome. An apt title working well for the book. It certainly has that magnetic effect to attract a reader who is in search of some self help book. The cover of the book is really interesting. A lady with shades of different order mixed in unequal proportions is shown on the cover. It suits well with the book which shows different shades of life and with a monotonous background things reach another level because the book has the same sort of concept. “Colours of life” is a sort of self help book. The author has divided the book in two parts and I was impressed by the way the realizations were done in order to draw the inferences. I saw many things which are often heard from the elder ones. I felt nice while reading it. It felt I am talking to an aged person one on one and he/she has opened up her treasure of good talks in front of me. Part 1- Rainbow, has taken reference from VIBGYOR and every colour has shown its sheen in the form of a story which is both inspirational and good for the soul. The smoothness with which it was done is highly commendable. Out of seven stories or essays or small talks whatever one refer it to be, I loved “Confident Blue” and “The Courageous Red” the most. Part 2 had a lot of quickly wrapped up thoughts. The titles were convincing and half the work was done for me by that only. There were more than 30 chapters and after touching every aspect in a jiffy I had to wait for a minute for a personal realization. Many things will stay with me and I might forget a lot too but the essence which the book created around me will always be cherished. It felt the author is touching every pained nerve in a reader’s heart and trying to console him/her with the book she has penned. From all the chapters in the second part I loved, “At the right time”, “Darkness will fade away”, “Master your path in simplicity”, “Success Walks in”, “Walk like a warrior”. Will I ever return to this book? Well yes I will because life is painful and psychiatrists are expensive. Summing up- The book is worth having in your book shelf. Books are one’s guide and it is zillion percent true with “Colours of Life”. A lot of positivity is felt while reading it and one gets a break from the ever moving fictional tales which has the ability to run your imaginations but don’t allow to look beyond the limits which a non-fiction like “Colours of Life” can do. Well the book was full of inspiring and heart touching quotes. Every chapter had some unusual saying tickling your nerves. Kudos author for writing such radiant one-liners. · The topics covered were vast. · The book sounds really caring and soft, giving a feel of vintage talks with the oldest member of the family. · Quotes at the end of some chapters. · With happiness counted at such great level, there must be miseries of high order. If there was kept a balance between the two sides then a grip could have been maintained. Reading the same essence over and over can make people reach boredom. · The thoughts appeared repetitive, said in a different way every time. Darkness can be removed with the positivity shining smoothly in the whole book. It is a must read for loners and pessimists. 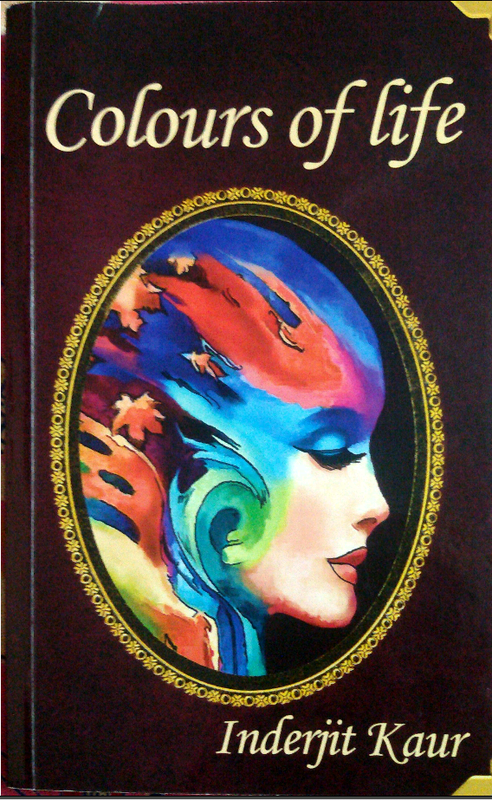 Inderjit Kaur is an author, a motivator with a powerful voice capable of spreading positive words through her writings. A highly influential blogger and an inspirational guide, who with her tag line: Keep smiling keep shining, has brewed the original concept of living through her books of living series. Inderjit Kaur, a full-time writer whose other books include “Living a more meaningful life” and “Elements of life”.